Low linear bank, emerging from Nipstones Rock, c.1m wide. 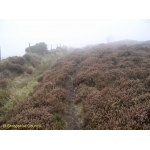 Site identified by Stiperstones Hills Archaeological Survey, 2003-2004. AP mark. Low drystone spiral pattern- modern art. 8m diameter x 0.2m high. 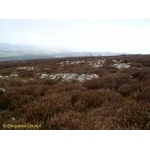 Site identified by Stiperstones Hills Archaeological Survey, 2003-2004. 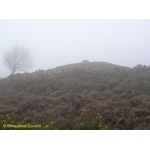 Earthwork remains of a possible spoil heap of post medieval date. 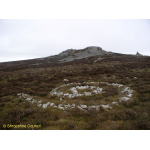 A possible ring cairn identified in the Stiperstones Survey. 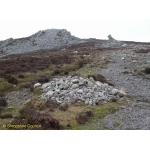 Drystone ring cairn with small satellite cairn to S (PRN 08778). 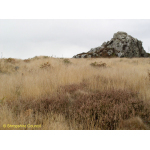 Identified during the Stiperstones Hills Archaeological Survey. Cairn at the north end of Cranberry Rock. 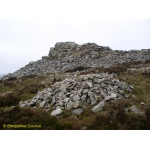 Drystone circular cairn. 6m diameter x 1m high. 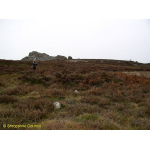 Site identified by Stiperstones Hills Archaeological Survey, 2003-2004. 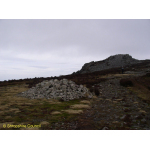 Small drystone cairn identified in the Stiperstones Hills Archaeological Survey. 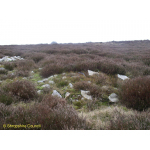 Large drystone cairn, probably modern, and partially overgrown at base.